ATLANTA, GA (October 10, 2018)- Benson Integrated Marketing Solutions, the multifamily industry’s first and largest Centralized Marketing Platform (CMP), announced today that its platform has been selected by student housing leader EdR to manage their marketing operations and streamline local property communications. EdR, based in Memphis, is one of the nation’s largest developers, owners, and managers of high-quality collegiate housing communities. The company currently owns or manages 86 communities, serving over 47,100 beds across 27 states. EdR’s portfolio was acquired in late September 2018 for $4.6 billion by Greystar, who also centralizes marketing operations with Benson. The program will enable EdR to further maximize portfolio value by delivering efficiencies, increasing controls, and lowering its overall cost of marketing portfolio-wide. Launching in phases beginning in late 2018, Benson will first utilize its centralized platform, dedicated account teams, and proprietary reporting and analytic tools to provide one single system of record for all of EdR’s print, design, apparel, promotional products and signage procurement. In addition, Benson will customize it’s Express digital communication services to enable EdR to increase speed to market through social media and email communications. EdR (NYSE:EDR) is one of America's largest owners, developers and managers of collegiate housing. EdR is a self-administered and self-managed real estate investment trust that owns or manages 86 communities with more than 47,100 beds serving 55 universities in 27 states. EdR is a member of the Russell 2000 Index, the S&P MidCap 400 and the Morgan Stanley REIT indices. For details, please visit the Company's Web site at www.EdRtrust.com. 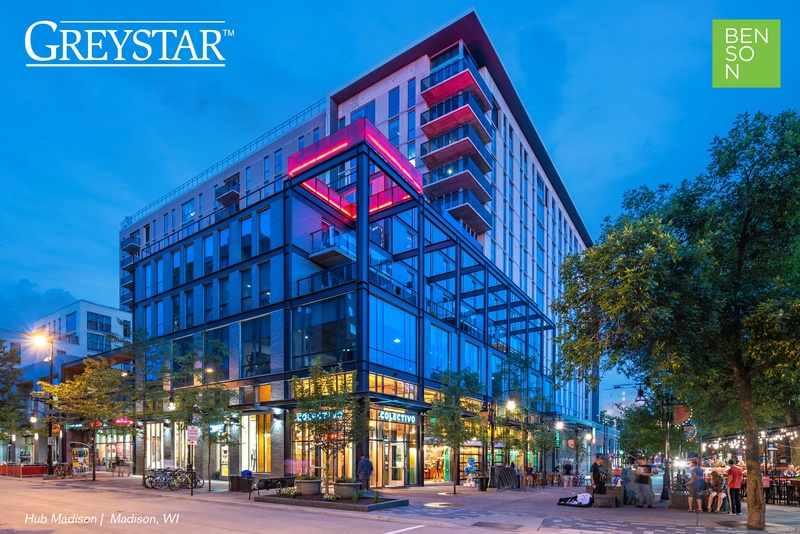 Greystar is a leading, fully integrated multifamily real estate company offering expertise in investment management, development and property management of rental housing properties globally. Headquartered in Charleston, South Carolina with offices throughout the United States, UK and Continental Europe, Latin America and Asia-Pacific, Greystar operates in over 150 markets globally and is the largest operator of apartments in the United States, managing over 480,000 units/beds, with an aggregate estimated value of over $80 billion. Greystar also has a robust institutional investment management platform dedicated to managing capital on behalf of a global network of institutional investors with approximately $31 billion in gross assets under management including more than $12 billion of developments that have been completed or are underway; $9.9 billion in the U.S. and $2 billion internationally. Following this transaction, Greystar will be the 2nd largest institutional owner and manager of student housing in the United States, in addition to Greystar’s global position as the largest student housing operator in Spain and the 3rd largest owner of student housing assets in the United Kingdom. Greystar was founded by Bob Faith in 1993 with the intent to become a provider of world class service in the rental housing real estate business. To learn more about Greystar, visit www.greystar.com. ** As of Q2 2018 but pro forma for inclusion of EdR transaction. Founded in 1992 and headquartered outside of Atlanta, GA, Benson Integrated Marketing Solutions is the most comprehensive, efficient and transparent Centralized Marketing Platform to procure, personalize, and track multifamily property marketing activities. Capabilities include award-winning products and services in apparel, creative, design, signage, print, promotional products as well as communication technology. Benson proudly serves over two million apartment units with over 12,000 registered users. As a dedicated partner and single supply chain for marketing products and communications, Benson increases profitability by saving time and resources with unprecedented accountability. Learn more at www.YourBenson.com.